Keeping your small business organized is a challenge. But so is managing a home – whether you are working in or out of it. I continue to look for new organizational methods and would love to hear your tips! Here are some ideas to get you thinking! My favorite, longest running idea is menu planning. We started very early in our marriage (almost 24 years ago). It was so much easier to know what you were having for dinner when we got home from work. You can thaw the meat ahead of time. Whoever gets home first can start the meal. And there are a ton of resources available today on the internet. Everything from exiting menu plans to amazing recipes! Start by writing all the meals you love down on index cards or in an Excel spreadsheet. I like to categorize them by type of meals: chicken, beef, pasta, soups, etc…. While you are at it, write down the ingredients next to the meal. Every week, plan a menu. Try to think about which nights you will be on the go, or whether or not you can plan for leftovers. Using your list, add the ingredients you need to buy to your grocery list. Some people even go so far as planning a monthly meal plan. One last tip as far as shopping is to create a custom grocery list. Again, I did this in excel. I created a column of boxes next to a column of foods I regularly buy. I leave spaces in between sections so I can write in items. The list is laid out in order of the store. I print several out so that when the kids tell me “we’re out of….” I tell them to write it on the list. 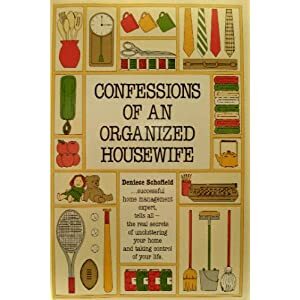 I loved the book “Confessions of an Organized Housewife” shown above. I still use a lot of ideas I learned from her book. Others I used for a while but eventually evolved my own variations. I used to clean heavily once a week. Now, I spot clean more frequently and sporadically. Please take some time to look at a few of my favorite blogs, where you will find suggestions from chore charts to household management. Ideas from my friend Sarah, mom of 6, over at Clover Lane. We are cut from the same cookie cutter I think..
It’s nice to find a kindred spirit. I love home organizing! I could read about it all day ;). Thanks for sharing these tips! I love that book, too! I don’t have a lot of homemaking books but it’s one of them. I have laundry days, too – have for years. Mine have always been Monday, Wednesday and Friday but I’m going to have to switch Friday to Saturday because of a scheduling issue. I’ve tried doing a load a day but I felt like I was doing laundry all the time! I like getting it done and then not worrying about it for a day or two. menu planning is a must here, although it sometimes falls apart. I do my list a little differently – I keep a white board in the kitchen and write things down as I need them (or as my kids or husband mention them). Then, when it is time to go to the store, I copy it onto my paper list. when I come back from the store, I wipe off the things I did get and usually find I forgot to get something…or sometimes I put something on the white board for a future time (ie a school function) so I will leave that on for the next trip. It is easy to maintain, although it never seems to wipe clean since as soon as those groceries are unloaded, it seems we need something else! But I can also take a quick glance at the whiteboard if my husband calls and says “what do you need at the store” – I can quickly scan and tell him something that can’t wait… easy peasy! housecleaning is not something I am well organized about…unfortunately. I need to get better at this!